So, I have decided that I’m going to rewatch Babylon 5. I originally saw the pilot – “The Gathering” – when it originally broadcast. It was luck. Living on a farm in the middle of nowhere central Virginia, I grew up without cable/satellite/etc, so I only had access to like 5 broadcast channels. 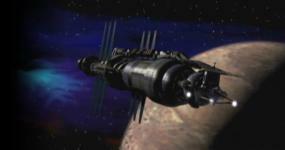 One day, in the middle of the day, I happened upon Babylon 5. My TV could barely tune the signal. I turned it on on the TV in my dad’s room and brought my small TV (which I mostly used for playing video games on my Nintendo) into the same room, and I tuned each to slightly different antenna positions so that when the signal faded out on one it came in on the other. I watched “The Gathering” and was in awe. The ships, especially the Vorlon ships, were so unlike anything I had seen before. And I grew up watching Star Trek The Next Generation. But nothing prepared me for Babylon 5. The unity of story across seasons, the whole idea that a story didn’t have to end at the end of an episode, that was revelatory to me. This will be a combination of both my thoughts on the show, having now long, long since seen the entirety of it, but also I want to try to reflect on my thoughts of having experienced these episodes in their originality. I did not get to see every episode as it aired, so there are limits to what I can say, but still. Why not experience it again. And I invite you to share with me; please comment as you feel a desire to do so. So, watching it now with a more discerning eye and ear, of course, there are some things that are cloying. Bits of acting that don’t really spark me. Areas where the performances, or the effects, or sets, or dialog aren’t as smooth as would be nice. But, I do have a certain nostalgia, so I can gloss over those moments. The scene of the drug smuggler isn’t the easiest, well flowing scene this show has ever done, but it does have character moments. Sinclair’s simple statement, “Because I gave you my word,” tells you a lot about him as a person. He’s a man for whom honor means a whole lot. He handles the situation with an attention to the possibility that someone could get hurt “in the crossfire.” He’s not a standard action hero, but he also isn’t unwilling to use force. He’s complicated. Complicated in storytelling is good. “Oh, [another thing] ….” This is a common thing Straczynski does in dialog: have someone go to leave a room and then interrupt that leaving with an “Oh, one more thing.” Sinclair uses it with the drug dealer. It’s an example of how Straczynski, while he might be great with speeches and dialog of larger moments, the bland, boring, everyday sort of speech is often formulaic. It’s too much TV-speak and not enough actual-people-speaking style. As someone who’s written a bit here and there, dialog can be tricky, and it can take a few runs through the writing process, and it often takes a willingness to read out loud as you revise to ensure it sounds like something someone would say. JMS hits some fantastic points of dialog in this show, but not all dialog he writes is golden. Of all the characters, Takashima is one that I am most sad to have lost when the show had to renegotiate between “The Gathering” and the show proper. Knowing that she would have been the one to have shot Garibaldi in the back. Knowing that she would have been the one to have been “Control” programmed by PsiCorps to gather information and betray the others, eventually to have been revealed and removed from the story before the end of season two, with a young, dour Russian to replace her. I would have loved to have seen Takashima’s character played to its end. I love how when we first meet G’Kar, she basically is like “Deal with it,” to him. She’s strong. She carves that line and then dares you to cross. I come to this show mostly with Star Trek The Next Generation as my experience with science fiction. She’s unlike Yar, who still needed authorization from Picard or Riker to act. Takashima is authoritative. And she’s unlike Troi, who was, shall we say, squishy. She’s a bit more like Leia in Star Wars. Commanding. Sure of herself. And it would have been nice to let the character go where it was going to go. It certainly would have hurt more seeing her shoot Garibaldi than it did the nearly miscellaneous 2nd in command of security. The story of this show is, from start to finish, very political. It recognizes that it’s hard to build something and even harder to get others to help you do it. Such a station is not easy, and it’s always on the edge of falling apart. With Star Trek at the time, there was almost always a sense of, of course it’ll end okay for everyone. Babylon 5 takes a few before it can definitively prove to you that that’s not so here, but it starts laying that thematic framing from the beginning. The politics of ambassadors, of gathering support of alien governments, of different people having different agendas, which sometimes clash with one another, it all ties together to make the on-going story tense. Sinclair has a missing period of time in his memory. This is not resolved by the end of “The Gathering;” in fact it’s pointedly left open to tell you that the story is not over. It’s serial, not episodic. That was new for me. Last edited by vacantlook; July 4th 17 at 09:28. I so prefer the Minbari prosthetics and makeup in "The Gathering." It feels complete, more richly designed. The ears, especially, feel real, whereas in the show are blatantly a flat prosthetic. I've tried to find it but can't currently. There was a series of art pieces done to help sell the show. The one of Delenn had, then, him with blue skin and black eyes. The appearance of the character sure did change. The lighting is also something I prefer in "The Gathering." The C&C especially is darker. They're in space. It makes sense. Limiting light where it's not necessary would save energy. And it looks nicer, giving it an in-space feeling. It's something I wish had carried over to the series. Okay I am not going to quote everything from the first segment. I am super excited you have started this journey and I can't wait to hear your thoughts. I'm not going to lie, you are going to hit a lot of moments where the acting and dialogue skid off the tracks a bit, but they are far fewer than the moments where it all hits a grand slam. I very much agree on Takashima. Her being Control would have resonated so much more than random guy. I think it is a flaw in the show that they tried to get away with introducing that guy only a few episodes before he turned out to be the traitor. It was also odd because he didn't seem to be established as Garibaldi's second in command. Before Garibaldi says that he got shot in the back by his own second in command in Season Two I assumed Lou Welch was second in command. I've watched The Gathering many times and my opinion is that the Minbari design is a little too close to the Narn design. They are almost the same shape with different skin tones. I will say that you are right about the ears. I also feel like the question of masculine/feminine figures into it. If Delenn maintained her original appearance it would have been tough to discern much being physically feminine about her. I could tell Na'Toth and other alien women were feminine, but that makeup made it very difficult to find anything feminine about Delenn appearance. I know that was a point when The Gathering was first conceived, but it wouldn't have worked moving forward in the direction they went. I definitely agree with this sentiment. This is something that worries me about a B5 reboot. I worry that when it comes to the look of the show the money people who come on board with JMS will insist the station look a certain way, bright and according to modern SciFi equivalents, ie Star Trek. I think there are parts of the station that should be bright, like luxury hotels, Ambassadorial quarters, and all of the open areas of the central core because that is where plants need to grow. But places like C&C should return to the look of The Gathering. I love the look and feel of B5 and messing it up is one of the things I fear most about a reboot. So there was a year between when “The Gathering” aired and when this first proper episode of the show was broadcast. There were changes. Takashima, Kyle, and Lyta were replaced with Ivanova, Franklin (who doesn’t show up in this episode but soon will), and Talia. Additional new characters are also introduced. Vir in this episode, and eventually we'll get Lennier and Na’Toth. This show really did have a large cast, and for the most part, the show is able to feel balanced in how much time is given to different characters. In introducing two new characters – Ivanova and Talia – having them butting heads allows the plot of that interpersonal conflict to give us introductory revelations about the two of them while not feeling like an introduction. The main plot of the episode is political, and though it’s wrapped up cleanly, it still feels like it has a certain level of weight. And there’s the little background bit about the election, but it’s referencing events that are mostly occurring well offscreen. We have to ask ourselves why is it important since it doesn’t impact anything in this episode, and that suggests it will have to be important later on. That suggestion carries with it the necessity that this show will be serial, not episodic. We get to see a good bit of the Starfuries in this episode. I always loved the original Starfuries way more than the Thunderbolts that later start showing up in the show. I love how real the Starfuries feel. They move like they’re actually in space. It’s nice. The raiders are very much plot-of-the-week no matter when they're used in this show, but they are a reasonable trouble the people living in this world would have to deal with. We get Londo’s prophetic dream referenced for the first time. I wonder if anyone who watched originally ever saw this and thought that it was more than flavor for the episode, that what he dreamed would indeed happen eventually. Londo’s sense of guilt over the danger his nephew is in is mournful and angry. G’Kar is angry too. He feels a absolute need for a sense of justice, but clearly goes too far for a long time. Neither one of them is right and both of them are right. In other words, they’re not clean characters; they’re complicated. Londo and G’Kar’s arguments feel deep, beyond the two of them, and long-lived. This show has history built into how characters react to circumstances and each other. We get way more of Kosh in this than we did in “The Gathering.” He is, as Dr. Kyle said, “pretty alien.” That he is an ongoing character is exciting because a character as odd and cryptic and grandiose like him on another show would easily have only ever been a one-episode sort of thing. It’s understandable because one wants viewers/readers to be able to connect with and understand characters, and a very alien alien would need to be really odd, risking the establishment of that connection. This episode, though it wasn’t the first filmed, works really well as a first episode. It has enough moving pieces to remain interesting, but still gives us significant character insight. I like the appearance aesthetic of the Soul Hunters, but the behavior is too silly for my personal taste. I think that might have a good bit to do with my dislike of the episode. It certainly isn’t that W. Morgan Sheppard is a bad actor. I love seeing him as G’Kar’s uncle later in the show. We get our first look at the new doctor. Steven Franklin is a big personality. Definitely different than Kyle, and that we can experience such easily recognizable differentiation after only such brief experience with each of them takes some creative writing and production skill. Once again, we get to see actual space behavior with the Starfury going out to grab hold of the Soul Hunter’s ship. I do love that. I can imagine some people would watch it and feel like it’s not exciting because it’s a more technical form of flying a craft, but that is what makes it feel more real to me. Delenn’s agitation makes sense given what Soul Hunters have done to the Minbari in the past, but the performance of her freaking out is a bit too heavy handed for me. I think maybe a lot of what makes it not work for me is that Delenn/the Minbari problem with the Soul Hunter has too much expository telling instead of showing. The portion of the conflict that is shown – him capturing her – feels generic to me for some reason. It’s a very personal story, but I’m not sure we know Delenn well enough at this point for it to have as strong enough of an impact as it would if we had had enough time to fall in love with her character. Compare how the threat to her feels so much weaker here than in “Comes The Inquisitor.” We do get the fact dropped that Delenn isn’t just a simple ambassador, so that the Minbari have some unrevealed invested interest in this station and in Sinclair in particular are points that are emphasized. The short scene of Ivanvoa and Franklin giving the memorial for the Lurker who died is strong and emotional. It’s a great moment. This is definitely not a worthless episode; there are some good parts to it, but just not enough to excite me. I'm delighted to see you re-watching, Vacantlook, since I am re-watching myself in order to show it to my sweetheart. We are well ahead of you, however... closing in on the end of Season 3. If you catch up, I'd be happy to bring my own reflections to this thread. As it is, I've got the S3 drama too much on my mind to dive back to the (comparatively) easy-going days of S1. I'll start my own thread, though I will not go episode by episode. I always loved the StarFuries, too, perhaps especially because the first season always had a variant of the show's main theme play as their "launch" music. So, Londo “falls in love.” Does he really though? Aside from being beautiful and giving him attention when he wants praise and admiration, what does Adira bring to the table to truly be a display of a loving relationship? Given that Londo is so into Adira is the central premise of this episode’s conflict, it really needs more time than a single episode for me to really buy their relationship. Unlike with many guest characters in season one, the actor playing Adira does well with what she has. Her slaveowner, however, is generic and uninteresting. Ivanova’s talking to her dying father is nice in theory, but Garibaldi’s tracking her spends too much time metaphorically doing boring paperwork. And the actual acting from her father and accompanying music is a bit too melodramatic. And how conveniently timed that he should die just at that moment that she called. “What do you want, you moon-faced assassin of joy! ?” Even rougher episodes can have some funny moments. I do like the scenery for the restaurant scene, even if it doesn’t add much of anything to the story. It’s something that today’s CGI would make way easier, but I would have liked to have seen even more of the full interior of the tube of the station in this show. The show doesn’t quite hit me with the immensity of the inside of the station and how odd it would feel to be standing there and look up and see buildings and people walking around on what sort of is like a far away ceiling from your perspective. Oh, and this is our second sighting of n’grath. I like that they were interested in giving us a non-humanoid alien, but is he really an alien or is he just a giant bug? First episode filmed. It shows. So, Dr Franklin’s archeology professor shows up. Dr Franklin is a medical doctor. He had an archeology professor? I guess it must have had something to do with an elective or part of the xeno- part of Franklin’s xenobiology specialization. Still, it feels awkward. Living technology. At the time this was written, I guess the idea was more of a revolutionary one? I can’t now imagine someone in the future being surprised that a more developed species would have such tech. It does lay the groundwork for the idea though, which’ll come back with the Vorlons and Shadows. The actual being taken over by the technology though is cringe worthy acting, as is Sinclair’s rage acting while trying to piss it off. The music is especially silly in this episode. Part that just played reminds me of first season Buffy The Vampire Slayer’s music. The why-we-have-to-go-to-the-stars speech at the end though is nice. Still, it’s hard to slog through the rest to get to it though. I can see Andrei Ivanov holding on to life until Susan calls again, especially if he knows she's likely to and he has some unfinished business. The brain can have more of an influence on the body than is sometimes acknowledged. Melodramatic, yes, but sometimes reality is more melodramatic than we give it credit for. When I showed "Infection" to my sweetheart, I warned that it was one of the worst; and was surprised when my beloved said "It's the best one I've seen so far." Yes, it's painfully rough in execution, but the general themes (the impossibility of purity, becoming what one fears, and of course the speech at the end) are actually fairly solid, and I guess those were appealing enough. My favorite bit of Infection that's not the speech at the end: we overhear Garibaldi telling the reporter the end of a story, which years later and without any fanfare we hear the middle of: how he and Sinclair met. All we hear is "...and three days later we walked out of the desert! ", all cheerfully. Naturally the reporter didn't get the full version of the tale, with all the Shadow ship/Psi Corps stuff. But I really like that Garibaldi holds onto this little secret, while hinting at it to various characters, through the whole show. Even when he mentions seeing "some of" the Shadow vessel/Psi Corps operation, he doesn't tell the rest of the crew that it's how he and Sinclair met. Okay you are going way faster than my current busy schedule can keep up with. Guess I will just make comments on Soul Hunter. Like most B5 plotlines I don't care for, JMS always comes up with an interesting way of dealing with it that ends up making me care for it. I have never been a fan of the "Soul" aspect, but I think it does give an added dimension to the B5 Universe. Is it really a soul in the orb or, like you said, just an "imprint of a person's mind"? And I love that Franklin points out this possibility in the episode. I will also say that you made an interesting point when you said Londo and Adira's relationship needed more time. That is a common sentiment you will hear from me. I feel that so many episodes of B5 people feel are weak are actually only weak because JMS made the mistake of trying to tell too big a story in one television episode. A prime example of this I always like to point to is INFECTION. If that episode had been a two part episode it would have worked so much better because JMS wrote an epic plot there. I mean you have the extinction of an entire species to work with. I think that episode would be perfect if things had been given more time to create more detail and form. Everything feels rushed. Last edited by Looney; July 7th 17 at 04:54.